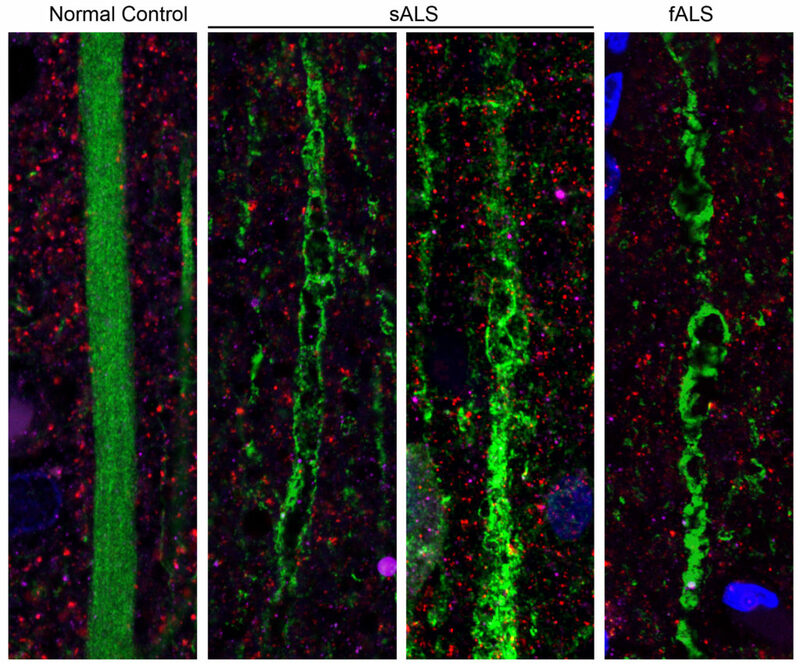 The degeneration of upper motor neurons in sporadic ALS (sALS) and familial ALS (fALS), compared to a control. For years, research into Amyotrophic Lateral Sclerosis (ALS) — the progressive neurodegenerative disease — has focused on the death of motor neurons in the spinal cord, which was believed to be the driving mechanism in ALS pathology. The death of motor neurons in the brain’s cortex, called upper motor neurons, was understood to be secondary to spinal neuron degeneration, and less-frequently studied by ALS investigators. In a new review published in Nature Reviews Neurology, however, Hande Ozdinler, PhD, assistant professor of Neurology, outlines how recent discoveries support a different understanding of the mechanisms underlying ALS: that the loss of upper motor neurons in the cortex is critical for disease pathology, and may be essential to developing better diagnostic tools and treatments for ALS. The review was co-authored with scientists at the University of Sydney. ALS is a fatal degenerative disease of upper and lower motor neurons. As motor neurons break down, patients experience progressive difficulty speaking, swallowing and breathing, and eventually paralysis. The average survival after diagnosis is two to five years, and there is no cure. The current review not only summarizes the growing evidence that upper motor neuron degeneration is an early feature of ALS, but also demonstrates that cortical hyperexcitability is an important diagnostic biomarker. “Before patients even start to show symptoms of ALS, you can detect that there’s something wrong in the cortex,” Ozdinler said. ALS is currently difficult to diagnose, and a new approach to identifying the disease earlier could lead to faster administration of therapies, as well as increased recruitment into clinical trials. 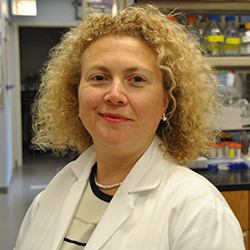 Hande Ozdinler, PhD, assistant professor of Neurology, was the co-author of a new article in Nature Reviews Neurology about the importance of upper motor neuron degeneration in ALS pathology. Ozdinler’s lab — one of three research laboratories supported by the Les Turner ALS Research and Patient Center at Northwestern Medicine — is dedicated to the investigation of upper motor neurons. In 2013, her lab developed the first tool for visualizing the cells with a green fluorescent protein, and has since published numerous papers elucidating the mechanisms behind upper motor neuron degeneration. This month, Ozdinler is also the principal investigator on a study published in Scientific Reports, a Nature journal, which provides further supporting evidence to the review’s thesis. The study showed, for the first time, that the degeneration of upper motor neurons in patients with ALS occurs in apical dendrites of Betz cells, important sites of neuronal connectivity. Ozdinler is also a member of the Robert H. Lurie Comprehensive Cancer Center of Northwestern University and the Cognitive Neurology and Alzheimer’s Disease Center. The Scientific Reports study was co-authored by Marsel Mesulam, MD, Ruth Dunbar Davee Professor of Neuroscience, Changiz Geula, PhD, research professor of Cognitive Neurology and Alzheimer’s Disease Center, Eileen Bigio, MD, professor of Pathology, Baris Genc, PhD, a postdoctoral fellow in Ozdinler’s lab, Javier Jara, PhD, research assistant professor of Neurology, Amiko Lagrimas, a post-bachelor’s degree fellow in Ozdinler’s lab, and scientists at the University of Chicago. The research was supported by the Les Turner ALS Foundation, the Wenske Foundation, National Institutes of Health grant R01NS085161-01 and National Institute on Aging grant P30 AG13854.